Have you heard the one about the first-timer who entered a contest and won? 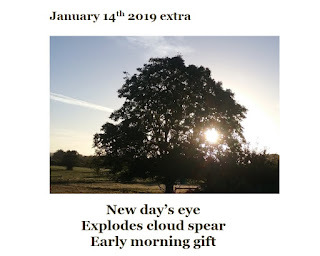 That was the peculiar situation that happened when I decided to enter a few of the photo+poem creations I've made for the 2019 in Focus books in the photography section of the local flower and produce show. I was nonplussed when I won two sections over other people who compete at National level. I can only assume none of the judges had ever encountered photos with built-in verse before! This is the "Tree" winner. However... I wouldn't use the situation in a novel. No one would believe it.